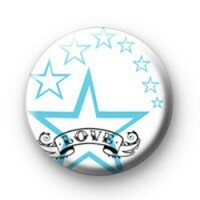 This white pin button badge has lots of blue stars around the edge and one big star with the word love written in a tattoo style font. It is decorative and would look great on your school bag or used in your craft projects. We have a lot of love-themed & Valentines Day badges in the shop so if you're looking for a few more designs then be sure to take a look at those too.